Rapid assignment of bacterial pathogens into predefined populations is an important first step for epidemiological tracking. For clonal species, a single allele can theoretically define a population. For non-clonal species such as Burkholderia pseudomallei, however, shared allelic states between distantly related isolates make it more difficult to identify population defining characteristics. Two distinct B. pseudomallei populations have been previously identified using multilocus sequence typing (MLST). These populations correlate with the major foci of endemicity (Australia and Southeast Asia). Here, we use multiple Bayesian approaches to evaluate the compositional robustness of these populations, and provide assignment results for MLST sequence types (STs). Our goal was to provide a reference for assigning STs to an established population without the need for further computational analyses. We also provide allele frequency results for each population to enable estimation of population assignment even when novel STs are discovered. The ability for humans and potentially contaminated goods to move rapidly across the globe complicates the task of identifying the source of an infection or outbreak. Population genetic dynamics of B. pseudomallei are particularly complicated relative to other bacterial pathogens, but the work here provides the ability for broad scale population assignment. As there is currently no independent empirical measure of successful population assignment, we provide comprehensive analytical details of our comparisons to enable the reader to evaluate the robustness of population designations and assignments as they pertain to individual research questions. Finer scale subdivision and verification of current population compositions will likely be possible with genotyping data that more comprehensively samples the genome. 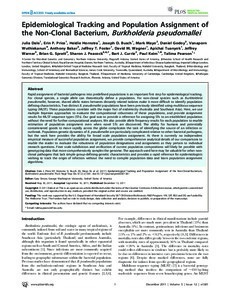 The approach used here may be valuable for other non-clonal pathogens that lack simple group-defining genetic characteristics and provides a rapid reference for epidemiologists wishing to track the origin of infection without the need to compile population data and learn population assignment algorithms.